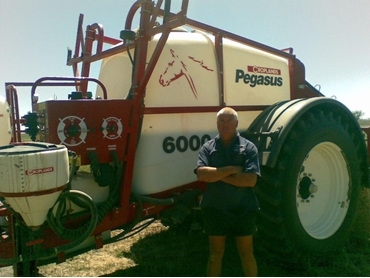 NSW farm manager, Lloyd Johnstone, upgraded to a Croplands Equipment Pegasus 6000 trailed boomsprayer to increase productivity, and now he is easily completing 400ha a day. A desire to move into controlled traffic farming while increasing productivity recently saw Johnstone, with some input from local machinery dealer Jack Ryan, trade his 18 metre self-propelled 3640 Spray Coupe boomsprayer with a 1136 litre capacity tank, on a new Croplands Equipment Pegasus 6000 trailed boomsprayer, which boasts a 30.5m boom and a 6000L capacity tank. The single axle, fully welded chassis-design Pegasus came on two metre spacings and is compatible with a 15.2m planter for working up and back. “There were basically three reasons why I went for the Pegasus trailed boomsprayer,” says Johnstone. “Apart from wanting to convert to controlled traffic, it was cheaper than buying a similar capacity self-propelled sprayer and it gave me the flexibility to carry as much water as I wanted as dictated to by conditions. “For example, when it’s wet, I only need to half fill the tank so I can get around then I can easily revert to a full tank load in better working conditions,” he adds. With the help of Croplands Equipment service technicians, who arrived on Johnstone's property just days after the Pegasus was delivered to assist in fine tuning the crop spraying equipment, Johnstone was quickly into 12 hour shifts to complete a summer program of 4500ha. With four tankfuls a shift, he easily knocked out 400ha day at water rates of 60L/ha. A bonus with the new trailed boomsprayer was the addition of a new Outback S3 RTK auto guidance system, which saw Johnstone start to creep into night spraying, to extend his spraying window. “It’s a strong unit that is very stable,” he says. “I’ve got melon-hole country and I also sprayed over some old cotton rows which shook up the tractor but didn’t disturb the sprayer. “I remember hitting a couple of good-sized holes and closing my eyes and gritting my teeth but while it shook me up in the tractor, the sprayer hardly moved,” adds Johnstone. The 20.8 x 42 tyres on the trailed boomsprayer provide excellent floatation and a huge rolling radius, and combined with a load-sensitive self-adjusting air-ride system, provides the suspension needed in rough conditions, regardless of whether the tank is full or empty. “It just travels brilliantly so it’s one less worry you’ve got while you’re concentrating on the spraying,” says Johnstone. Another feature liked by Johnstone is the hydraulic 180 litres a minute diaphragm pump, which has a good pressure range to cater for all spraying conditions. The Pegasus 6000 trailed boomsprayer also boasts a 60L Chem-e-flush induction tank and Enviro Drum transfer kit, a 340L flushing tank and a 30L hand wash tank, which provide safe working conditions for the operator. The main tank is a top or bottom fill with a dump sump for total emptying, dual agitators and a tank rinsing facility and drain outlet. A Croplands Equipment BA7000 controller is also fitted, offering auto rate control, dual line capabilities and a range of operating functions to provide at-a-glance information to the operator.